SEPTA is known for having a comprehensive transit network with many lines serving many stations. In some cases, especially on lines with more than two tracks, customers can reach destinations via multiple routes or trips. Unfortunately, those wishing to travel to these stations sometimes are left to guess what will be the next train to their destination. Listing this information on the preexisting station signage or via station intercom announcements could solve this problem. There are two main types of need for “Next Train To” signage: one for stations with multiple lines (e.g. Jenkintown, Wayne Junction, etc.) and another for stations with local/express service (e.g. Bryn Mawr, Paoli, Thorndale, Girard, etc.). At Regional Rail stations in Center City, platform departure boards could indicate which trains will serve which stations. 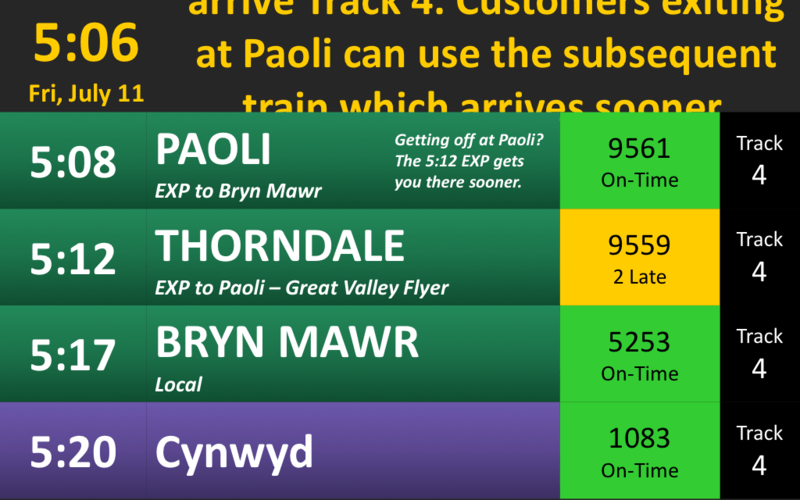 Multiple colors could also be used to indicate in red if a station served can be reached faster by an express train (such as taking the Great Valley Flyer to Paoli as opposed to an Express to Bryn Mawr, Local to Thorndale). At outlying stations, announcements could be made at stations to indicate when waiting for another train will lead to a faster arrival (such as for passengers waiting in Bryn Mawr). Subway stations could again use the same method of displaying “Next Train To” signs along with audio announcements made over the PA system. At stations which already have AVPA displays, this information could be added by modifying the software to display this information. 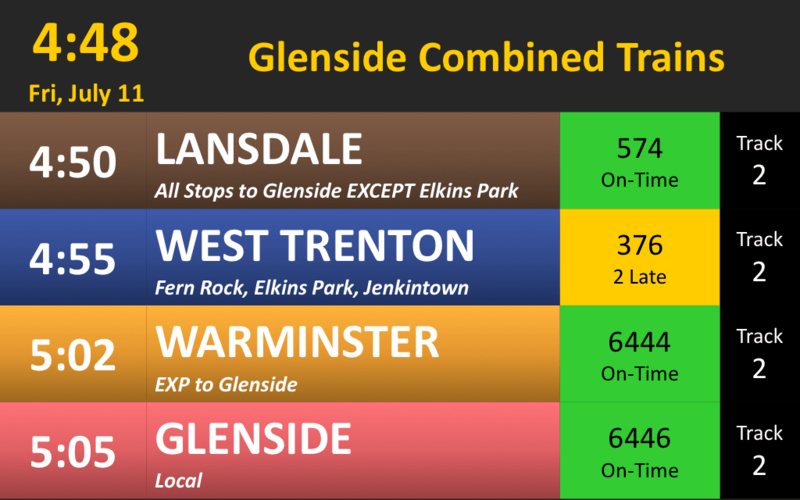 At stations with per-line monitors (Suburban, 30, and Market East), an additional monitor could be added to display trains serving the Glenside Combined portion of the main line. Jeff Kessler, 2018. All rights reserved.